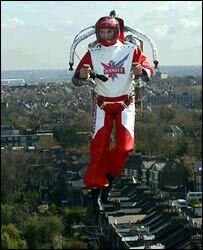 A stuntman who propelled himself 152ft (43m) into the air using a jet pack believes he has set a world record. Eric Scott wore a red and white jumpsuit for his brief vertical trip over the Castle Indoor Climbing Centre in Stoke Newington, north London. The Texan stuntman's flight was thought to be the highest human elevation using a Rocketbelt designed by the United States military in 1961. He said: "I am the first one in the books for the record, so it is neat." The generator is mounted on a fibreglass corset worn by the pilot, who is propelled upwards by two rocket nozzles which fire steam. Mr Scott's trip on Tuesday, the equivalent of a 12-storey building, lasted just 26 seconds. "It went well. I went up there and when I got to the top I did a little pirouette, a 360-degree spin, so that was fun," he said. He has used the Rocketbelt for nearly 500 trips since he was first offered the chance on a Michael Jackson tour in 1992. Mr Scott, 41, who is a film stuntman but also builds custom homes, was invited to perform in London for a promotional event by vodka drinks company Smirnoff. His next flight will be in the Brazilian jungle. David Hawkett, the science and technology editor of the Guinness database said: "We are waiting to get all the evidence from them, but I can see no reason why this won't be a record."